Follow this best leg workout and exercise tips for men to build bigger, stronger legs. Too many men in the gym neglect legs and focus their workouts just on arms and chest which explains why so many men have large, strong upper bodies on chicken legs. Don’t be one of them! Training the large muscles in your legs not only helps to build big legs it can also increase your overall muscle mass and size. A heavy, intense leg workout may stimulate a spike in growth hormone, creating a greater anabolic environment and helping to build muscle throughout your whole body. This leg workout for men from former IFBB Australian Body Building Champion & now expert trainer Paul Haslam focuses on the thigh and hip region. The leg muscles (and actions) involved being the quadriceps (knee extension), the hamstrings (knee flexion and hip extension) and the gluteals (hip extension). If you want to build big legs then forget about heavy five and six rep sets and the high intensity one/two set methods, this body part demands sufficient volume for optimum growth. 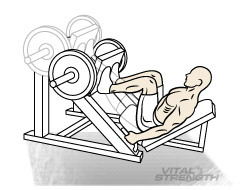 This leg motion is probably the safest form of the squatting movements. Because balance is taken out of the equation a better body position can be achieved alleviating any potential stress both on the knees and lower back. Those with short torsos or taller individuals who would normally have great trouble free bar squatting benefit from this technique immensely. 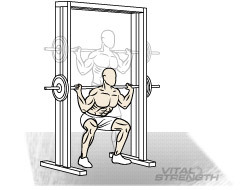 To start this leg exercise step under the bar with a shoulder width stance and take a half step forward with both feet. Descend until the thighs are just below parallel and return to the starting point. Ensure the knee bends in the same direction that the feet are pointing. This position of the body allows for an erect back as well as a more favourable position for the knee joint. By altering the position of your feet on the platform you can stress differing muscle groups in the legs by differing degrees. If the feet are placed high on the platform the action becomes more of a hip extension movement and less of a knee extension, thus placing less emphasis on the quads and more on the gluteals. If the feet are placed lower on the platform the movement becomes less of a hip extension and more of a knee extension, thus placing more emphasis on the quads and less on the gluteals. With this latter movement be wary of how far the knee travels over and beyond the foot placement. Excessive travel may place too much stress on the internal structures of the knee. Descend to a point where at least a right angle is formed at the knee joint. 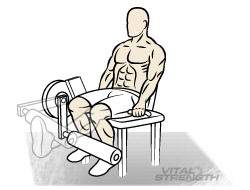 Everyone has performed leg extensions before so let’s try one leg at a time for variation. Try and keep the movement as smooth as possible and try and work the eccentric component of the exercise. 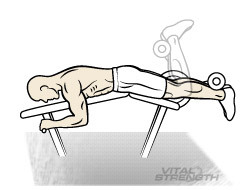 To add more intensity, add a two or three second pause at the completion of the extension. You may be surprised and find that one leg is noticeably stronger when doing this exercise. If that is the case have a qualified individual to assess your squatting performance to find if the imbalance manifests itself in your technique. Many injuries in resistance training are caused by imbalances. The hamstring group is comprised of three main muscles and the quadriceps are comprised of four main muscles. The ratio of work for these muscles should follow the same basic formula, i.e. 3:4 in terms of total work performed. This superset will work both actions of the hams very effectively. 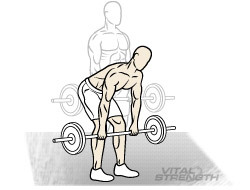 The Leg Curl is an exercise everyone should be familiar, however, the Romanian Deadlift may cause some difficulties. With a shoulder width grip stand erect with a barbell. Have a slight bend at the knees. It is crucial to the exercise to keep this same angle at the knee throughout the whole movement. Keeping a stable bend forward at the waist to a point where your hamstrings are near maximum stretch (you should feel this) then rise to the start position again while keeping tight at the spine. Have as minimal rest as possible between the curl/deadlift movements. This has been added to the leg workout to introduce an exercise that you may not have tried before. It gives a different feel compared to the other hamstring movements. A back extension apparatus is best for this leg movement, preferably one that has adjustments for the length of the exercisers leg. Place the knees on the pad and the ankles under the foot pads at the rear of the apparatus. Place the hands on the support bars at the front of the apparatus. By extending at the knees, travel in a forward direction so that the body is parallel to the floor. There is no movement at the hip joint. Using the hamstrings bend at the knees and return to the starting position. You may probably need some assistance from the hands to initiate the movement. To make the exercise harder you may place something under the rear of the apparatus to steepen the angle and bring gravity more into play. Alternatively you may secure a Dumb Bell at the waist with the assistance of a weight belt to increase the resistance. Building big legs has never been easy. Legs are large muscles that require a correspondingly large effort in training. Rewards (carved, strong, powerful legs) will come if you are persistent and consistent with your training. The more a leg workout is performed, the more skilled we become at performing it. More skill equals greater efficiency and therefore less muscle used per kg lifted. Regularly changing exercises every 4 to 6 weeks will provide your leg training sessions with enough variety that will allow you to stimulate more overall muscle fibres than before and consequently achieve better gains. After completing this leg workout for men ensure you fuel your muscles with supplements designed for growth. Vitalstrength Pro-Muscle is a premium muscle building protein powder chosen by bodybuilders, fitness models, footballers and men training hard at the gym.